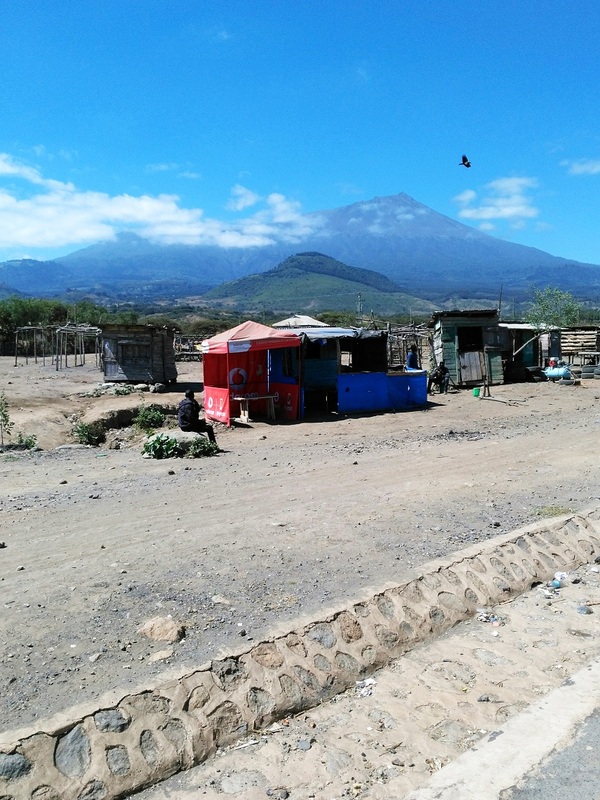 As part of her undergraduate studies at St Hilda’s, Kirsty Gouck (Engineering, 2016), spent eight weeks in the summer of 2018 working for the Nasio Trust in Oldonyosambu Village, North Tanzania. Kirsty found this placement through the University of Oxford Careers Service. Kirsty was responsible for researching and conducting out a feasibility and scoping study, including drafting a business and structural plan, for a sustainable social enterprise irrigation project. The long-term goal was to help improve educational outcomes for local primary school children. Kirsty was the project manager, researching solutions to overcome the food shortage at the local school through increased crop production. This required an understanding of fluid dynamics and civil engineering principles, alongside the ability to apply these to practical problems. Once delivered, the project would become a demonstration site for the Maasai tribe, who are culturally nomadic. The Nasio Trust’s mission is to protect vulnerable children, through removing or reducing the causes of problems facing them. Kirsty was one of two interns from the University of Oxford who used their knowledge of engineering and science to research new ways to address the food and water shortages in the area, with a concentration on irrigation. Kirsty spent her placement working closely with the community committee and staff in a mixed primary school in Oldonyosambu Ward, for children aged between 7 and 13, with 1129 pupils registered – although no more than 800 attended daily. The children were not doing well at school and the Nasio Trust had identified their lack of food as one of the main reasons for this. The children were not getting lunch and this was affecting their ability to concentrate and learn – many would drop out of school and become trapped in poverty. Kirsty visited the school many times, where numerous concerns were raised about the school facilities. For example, the rain water harvesting equipment had fallen into disrepair and hand-washing facilities were non-existent. Kirsty and her colleague Jed de Ruiter-Swain, a Biochemistry undergraduate at St John’s College, Oxford, were tasked with surveying the area to identify potential water sources to be used for irrigation purposes, as a sustainable solution to the food shortage. The next priority was to complete a report with recommendations for the charity. Kirsty was responsible for the engineering tasks associated with the project, while Jed led on the agricultural aspects including assessing crop growth. They worked with government officials, members of the local community, and representatives from other charities to carry out their assessments. One of their objectives was to improve coordination and communication between the groups. Another was to come up with solutions in partnership with them, so that the local groups would have ownership over, and be committed to, maintaining new initiatives. Kirsty began her assessments by conducting out a land survey of the area to analyse the water availability, and thus the feasibility of irrigation. She met with drilling companies to consider the viability of drilling a borehole in the area. The risks associated were deemed too great, due to the low probability of hitting water. She met with another charity to find out about sustainable projects already implemented and to consider the option of damming. The feasibility of introducing a new pipeline to increase water flow was explored with the Village Executive Officer, however this was abandoned due to insufficient funds. She researched the high fluoride village spring water source, to study its quantity, current use, and reliability. Due to negative findings regarding drilling and damming, focus was placed on this spring water source. The Nasio Trust had already identified lack of food as the major problem for the community, which led to Kirsty investigating irrigation as a solution. As part of her research, she analysed the flow of water from the source to the school, measuring the flow rate of water at various distribution points to compile data in order to determine a suitable method of irrigation using the spring water. The extremely low flow rate being diverted to the school meant water efficiency was crucial. Kirsty and Jed found growing maize with widespread crop disease was exacerbating the community’s food shortage. Farmers with a lack of understanding of effective farming practices were leaving crops susceptible to pests and disease. The school collects maize and beans from parents, to be stored in the school kitchen. Once the few bags they had were full, maize was left on the floor. About one third of their harvest was being lost, as the crop is susceptible to insect infestation and was not being stored safely. As part of her ongoing communication with the school’s Head Teacher, Kirsty identified the lack of hand washing as an issue and encouraged him to introduce facilities. It was felt that supporting them implementing this internally would ensure longevity. With her input, the school built tippy taps (hand-washing devices with hanging water containers that can be tipped over by foot to release water). This could reduce student illnesses and improve school attendance. Meeting with the Head Teacher to monitor the project while the school built their own tippy taps meant that the school took initiative and will hopefully be more committed to maintaining it in the long term – a step towards sustainability. After measuring the flow rate of incoming water at the school, it was found to be insufficient to irrigate a significant portion of school land. 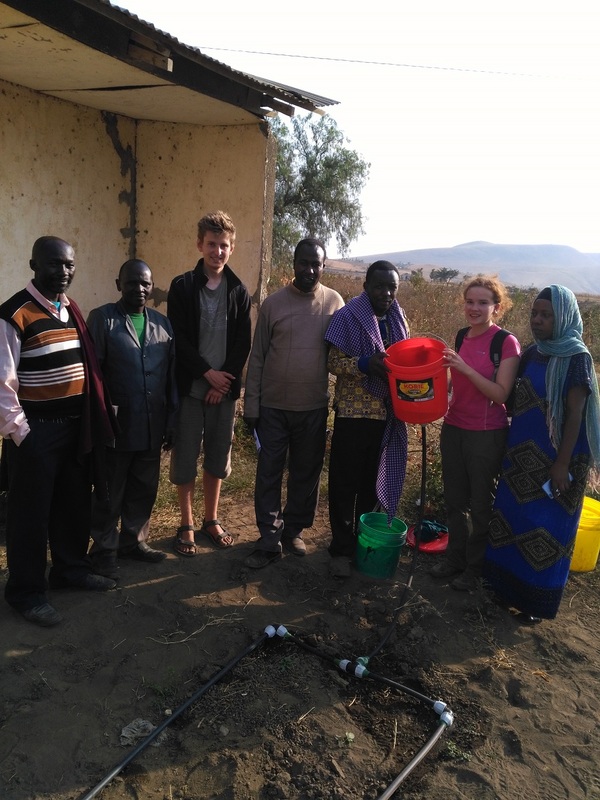 Kirsty decided to introduce drip-irrigation kits to the school, to be used as a demonstration site for the community. They could be used to grow vegetables as cash crops, to be sold in order to buy more maize than the land would produce. These kits target the plants’ roots, so water is not wasted on other parts of the soil profile, resulting in a very high water efficiency (around 90%). Additionally, the herbicide requirement is reduced because less water is applied between crops. Kirsty used local materials to develop the kits, sourced as cheaply as possible to enable members of the community to reproduce them. They held a demonstration for Oldonyosambu Primary School Committee and Village leaders using both English and Swahili, the local language, so that everyone was made aware of how they work and general repairs that may be needed. The focus was on producing something that the local farmers could easily replicate, with the aim of providing each family with access to food year-round. A substantial increase in food production community-wide would increase the amount per school child, without relying solely on the inadequate school land. Water quality is another significant problem in Oldonyosambu. Fluoride content in the water is very high, at 17.5 milligrams per litre; the Tanzanian limit is 4 milligrams per litre, while the WHO limit is 1.5 milligrams per litre. The two interns carried out research to establish if this would impact on growth of the new crops. They found that it would not be significant enough to be harmful. 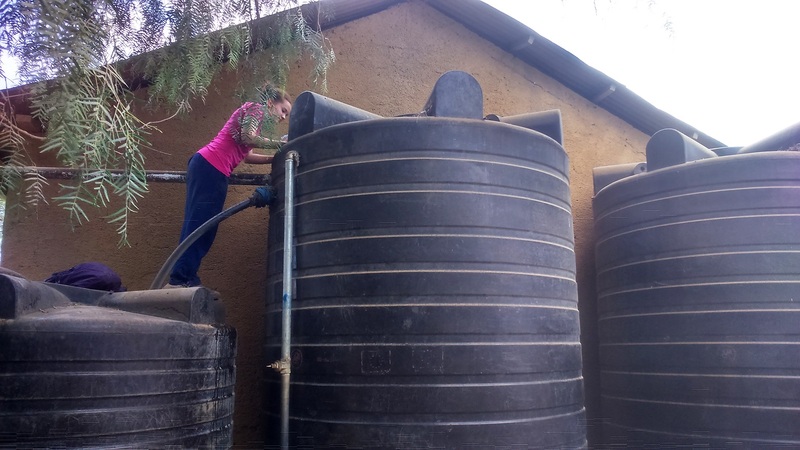 The Nasio Trust has made progress on this issue, introducing rainwater harvesting tanks to community bomas, with plans to expand this. and the government aims to bring safe drinking water to the area within two years. 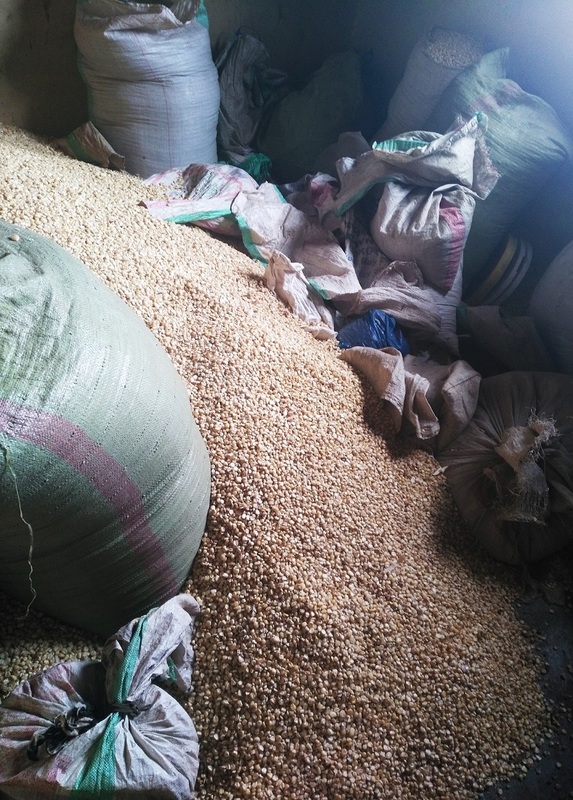 The interns found that two out of the five bags of maize collected from parents and stored in the school kitchen had been completely infested by insects. They then investigated solutions to this. Purdue Improved Crop Storage (PICS) bags offer a cheap and easy solution to cut down on post-harvest losses of crops such as beans and maize due to insect pests. A PICS bag consists of two layers of polyethylene and one of woven polypropylene, each of which is tied individually. The polypropylene layer adds mechanical strength, while the double layer of polyethylene creates an airtight, hermetic environment in the bag when sealed. As oxygen levels in the bag drop, insect pests contained within are effectively killed. Another advantage of using these bags is that farmers are less likely to use a large amount of pesticide, reducing student pesticide consumption. Twenty 100kg bags were given to the school and posters were displayed in the kitchen, with diagrams showing how to seal each layer. As a result of the project, the school has started growing vegetables as cash crops and is using the drip-irrigation kits. There is now a source of information providing a detailed description of the local agricultural practices and water network, to aid further projects in the area. 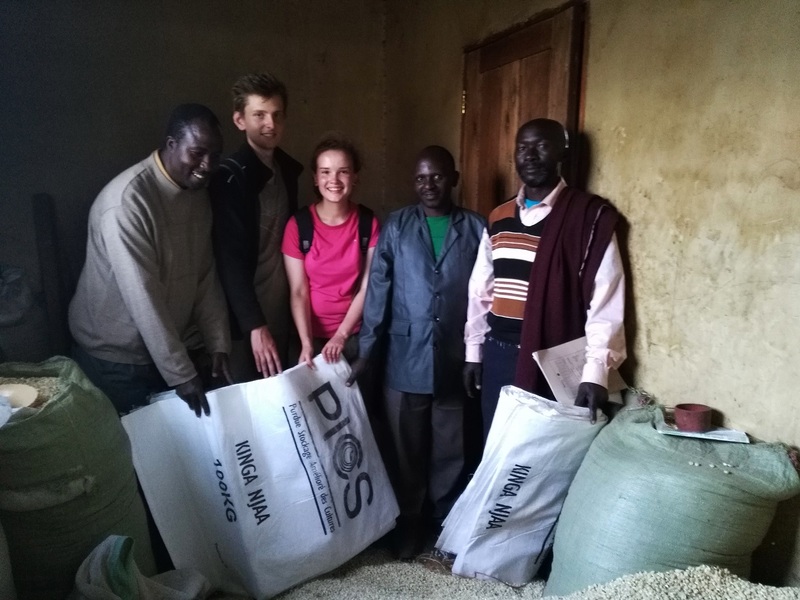 Kirsty and Jed’s research findings also led to the Nasio Trust providing the school with PICS bags for the maize, which has reduced post-harvest losses. Long-term, they hope that this will greatly improve the students’ well-being, health, and ability to receive an education.